Over the centuries Albanians have distinguished themselves by their bravery, generosity and wisdom; their contribution to the European civilization has unquestionably been remarkable. Knowing the history of the Albanians has made an immense impact on the strengthening of their national identity. Albanians, as one of the most ancient peoples in Europe, were the first on the European continent to embrace Christianity. Albanians produced such holy personages as Saint Eleutherius, Pope Clement XI, Saint Dardan, Saint Jeronim, Saint Ashtin, and others whom many other nations have attempted to claim as their own. Yet, the Slavs maintain that Saint Jeronim was a Croat and have understandably been proud of him. But here ís the issue: where was Saint Jeronim from? Were there any Croats living at that time in Dalmacia? Which peoples lived in Dalmatia? Illyrians were the ones living in Dalmatia back then, a historical fact that proves Saint Jeronim was Illyrian. Among those saints, about whom little is mentioned, is Saint Eleutherius, one of the predecessors of other Albanian Popes, and one of those renowned personages who contributed to the spread of Christianity, not only among Albanians, but throughout the entire European continent. 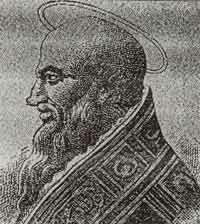 Hundreds of bishops from Illyria participated in the first Synod of Rome established in 130 A.D. This fact provides evidence to the existence of a well-organized church administration in Illyria during the 2nd century. The first elements of the church that constitute the foundations of Christian doctrine, the first seven ecumenical codes, are from llyrian territories (llyria was once called " The Island of Saints"). This is the best evidence of the contributions that Albanians have made to European civilization. Saint Eleutherius was born a hundred years after Christ in the town of Nikopol, a well-known town in Epirus. Some archeologists maintain that this is the present town of Preveza. He was educated in Rome under Pope Saint Aciteti (whose papacy lasted 11 years, from 157-168) where he received Holy Orders. In 177 AD, Saint Eleutherius was appointed Pope and assumed the Holy Seat at Saint Peter's. During his papacy, Saint Eleutherius spread the Bible to many countries of the Roman Empire. Based on existing data, after the beseechment of Lucas who was the King of England, Saint Eleutherius sent missionaries to preach Christianity -- the faith that civilized European nations and which remain predominant there to the present day. In 192 AD, after 15 years of his papacy, Saint Eleutherius was martyred by idolaters of Rome. Attempts by others to claim Saint Elutherius and Saint Jeronim as their own are numerous. In reality, Saint Eleutherius is neither Greek nor Roman as some historians contend. He is clearly an Illyrian predecessor of Albanians, born and raised in Epirus, a territory that lies from the Vjosa River to the Ambraky Bay in the south, from the Pindus Mountains in the east up to the Ionian seacoast in the west, a territory ruled by King Pirros in 277 BC. In one of Gjergj Kastrioti's (Skenderbeg) correspondences written in Kruja in 1460 to the prince of Taranto, he states, among other things, "We the Albanians are being called Epiriots."